#90 stored at North Freedom, April 2000. An annual event on the C&IM was a trip over the line for the road’s traffic department. Here in 1953, we see the final such train at the Springfield depot. 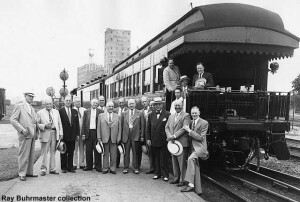 Third from right on the platform is C&IM president F.L. Schrader. The trips served to brief the off-line traffic solicitors on the latest improvements to the road, and to formulate plans to obtain more traffic. 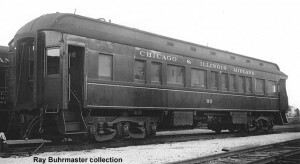 Business car #90 is believed to have been remodeled from a 17-window coach in the Chicago, Peoria & St. Louis Railway’s shop at Jacksonville, Illinois. The exact date of rebuilding has not been determined but it is assumed to have been prior to 1900. 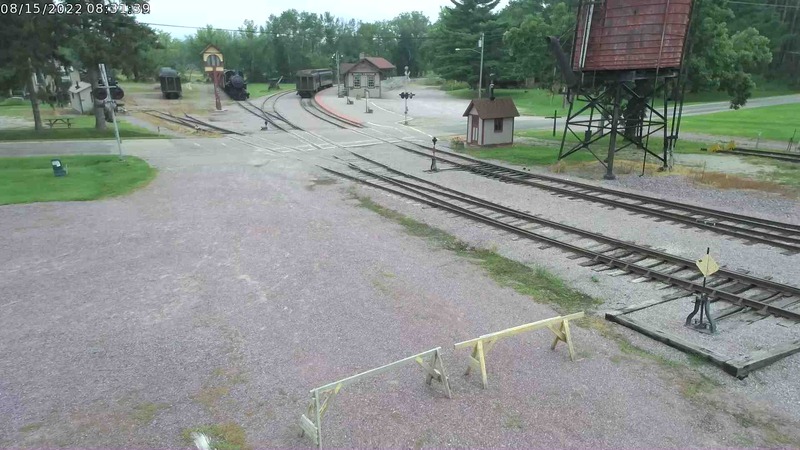 The coach selected for rebuilding was #49, one of six open-platform cars built for the road in 1890 by the St. Charles Car Co. Car #90 consisted of five rooms including two staterooms, a dining room, galley and an observation room. Initially, the car rode on its original 4-wheel coach trucks which were later changed to 6-wheel wood-frame plated trucks. #90 was of all-wood construction. 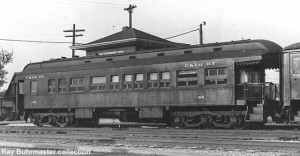 #90 served the CP&StL until its shutdown in July 1926 whereupon it was transferred to the newly formed Chicago, Springfield & St. Louis which operated the Springfield-Alton segment of the former road. It appears that while car #90 carried CS&StL markings, it was the personal property of former CP&StL General Manager William C. Hurst. By late 1926 Hurst had become Vice-President of the Chicago & Illinois Midland. In 1928 car #90 and its contents were purchased by the C&IM from Hurst for $5300. Within a year the car was badly damaged by a kitchen fire which resulted in a major rebuild at the C&IM’s Taylorville, Illinois shops. Car #90 emerged with a new interior, a steel underframe, steel-plated body and enlarged windows. Late in the 1930s, the old wood-frame plated trucks were replaced by used Pullman 6-wheel trucks. 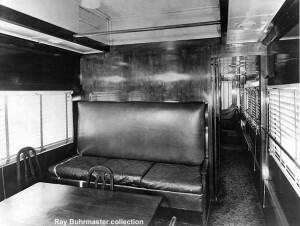 By the 1950s the staterooms wereremoved as #90 did not travel off-line and was used chiefly for meetings and inspections. In 1963, C&IM #90 was considered obsolete and was sold to the Marfax Steel & Railway Equipment Co. of Blue Island, Illinois for salvage. Rescued from demolition by several parties, #90 languished in storage in the Chicago area. 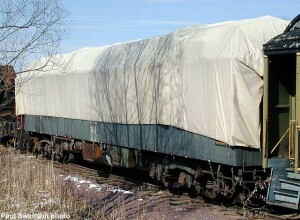 Some interior restoration and roof replacement was performed at Schiller Park, Illinois by private owners until the car was moved to Mid-Continent in 1978. Today, the car is owned by Mid-Continent and is awaiting restoration. The Chicago, Peoria & St. Louis Railway began in 1853 as the Illinois River Railroad. Through a series of mergers and expansions the road could boast of a Peoria to St. Louis main line plus a Jacksonville to Centralia segment. The road was constantly in receivership and finally shut down in 1926 after selling off its most viable sections. Early in the century the Centralia line became part of the Burlington’s coal-hauling Beardstown Division. In 1926 the Peoria to Springfield line was added to the Chicago & Illinois Midland’s expanding route financed by C&IM owner Commonwealth Edison Co. of Chicago. The remaining miles of the old CP&StL were rolled into two struggling shortlines that expired before World War II. C&IM’s origins may be traced to the Pawnee Railroad which began in 1888. The C&IM name came into use shortly after being purchased by the Illinois Midland Coal Company in 1905. Its predominate commodity was coal. Two years later, Illinois Midland Coal became part of Commonwealth Edison, who would own the road until 1987. 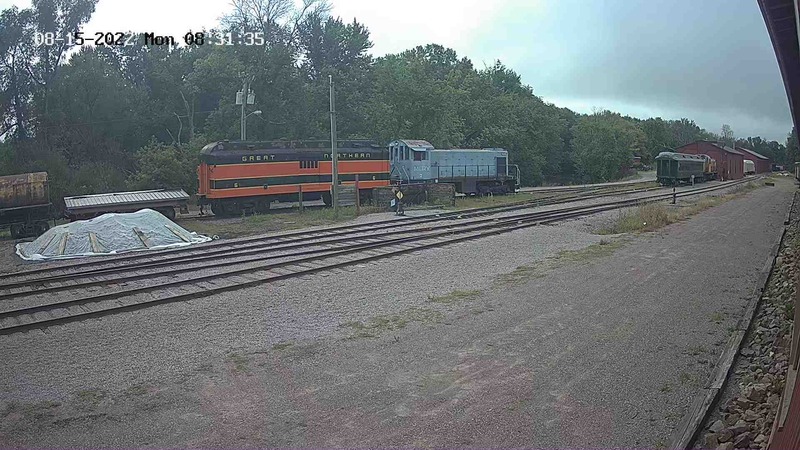 The railroad was held privately until 1996, when it was sold to Genesse & Wyoming Industries, which operates the line today as the Illinois & Midland. The St. Charles Car Co. was established in 1873 at St. Charles, Missouri in an abandoned car repair facility of the North Missouri Railroad. Passenger car production began in 1886. In 1899 St. Charles became part of the great American Car & Foundry Co. amalgamation. 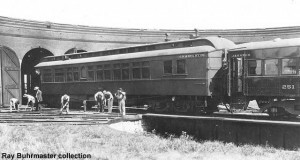 The plant was modernized in 1910 for production of steel passenger cars. AC&F’s streamlined passenger cars were all built at St. Charles, the end of car building coming in 1962. The facility survives for research and storage.